Original, fresh, satirical, gripping, addictive series about the adventures of the ship Nocturna’s crew sailing on the Eversea. I am not sure about the genre or the mix of genres applied. There is a ship and a crew but I don’t think they are pirates, but I am not sure. There are humanoid creatures called seasort but that is exactly what they are land-walking humanoid sea creatures, they are not shapeshifters. Then there is magic, but it is not clear where it’s coming from. I was sold the moment I saw the covers which are basically the same with minimal variations for all five books, and I still have no idea why, I was just convinced that I have to read this series. After the first book, I was quite angry that I had to make a break, because I really really did not want to stop reading. Nocturna League: The Witching Book (Nocturna League #1) available for purchase on Amazon. 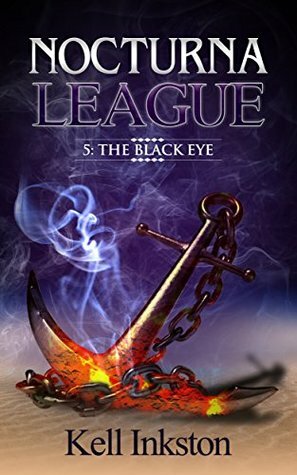 I was hooked after the fist couple of pages which describe a fight of two crew members of Nocturna, namely Dunklestein, the sharkman of the seasort, and Colette, one of the crew members in charge of cleaning duties, seemingly for the entertainment of the crew, but in reality for the betterment of Colette’s fighting skills. I have to admit that the writing style and the plot, and the story and the characters, demanded a little bit more of my focus and attention because they were so new to me, and the reading took a bit more time than usual, but once I started understanding properly what was going on, the pages just started flying. I was not disappointed regardless of my high expectations, because the book was as great as I anticipated or hoped for. There are numerous members of the crew and I could not really figure out one or two main characters, as they all play equally important part. Naturally, the captain, who is only known as The Captain, seems a bit more important due to his position of being in charge of everyone else. There are Colette and Dunklestein who I already mentioned, then Boris the cook, a lobsterman, and his cooking aide Grancis, then Jim with dual personality, and several others. Although the story is pretty short, the author manages to unveil this strange world bit by bit and does a great job with character development. Some characters are deliberately left vague, such as The Captain, whose character retains all the mystique to keep the reader puzzled and interested. The story itself is an episode with a definite ending. There is nothing unresolved in this book that would carry over to the next, apart from The Captain’s character. I immediately continued onto the next one because, as I mentioned previously, I got hooked and I cannot rest until I finish all the stories available. The second story was off to a fast paced start, two pages in and the book already startles the reader with an unexpected occurrence. This time I experienced a different kind of curiosity, as I was familiar with the style and the characters. Colette, Boris and The Captain take the spotlight, as the strange and suspenseful events take place. Again, regardless of the story being short, the author does a brilliant job on the character development and the expansion of the world which was already nicely developed in the previous book. The tone is slightly more satirical than the previous book, due to Boris’character. Nevertheless, it retains a certain seriousness and mystery brought by The Captain. As mentioned previously, Boris is a comical character, albeit a scary one, Colette continues in her rash and impatient manner, and The Captain is still mysterious. Te author deliberately peals the layers of The Captain’s character bit by bit, never reveling his true nature completely. And as in the previous book, the last scene belongs to The Captain and the infinite mystery of his character. If you think that I felt better finishing this book, you are wrong. It did nothing to assuage my addiction, it only spiked my curiosity for more. At the moment I am already dreading the last book and the completion of the series. Mind you, I was not even brave enough to find out whether the fifth book is the conclusion of the series, or whether it is continuing. I just know that I’m enjoying it immensely and I don’t want it to end. I am overwhelmed with the brilliance and the imagination of the author. It takes a special person, a rare kind of a writer who is capable of imagining and inventing a completely new world populated by such strange creatures, and than being able to translate such originality into words. After the third book, my addiction is so complete that I am having problems relating to other authors and their stories. Fortunately, I was informed by the author that there will be more books in future. I forgot to mention before that each book starts with an intriguing quote, and each of the chapters has a well considered title. This story plays out entirely on Nocturna, unlike the previous two stories, which gives the reader a better understanding of the layout and some additional creatures inhabiting the ship. The crew is under a supernatural attack and this story is mainly an exercise in how well some of the main characters know each other, which, in turn develops some of the characters further and gives deeper understanding of their personalities. For me, this was the most intense story so far, as it features constant action, action, action without any calmer periods. I also noticed that I am reacting with more irritation to any interruptions in my reading when it comes to this series. The writing is beautiful and consistent, and it does not seize to amaze me how the author switches between different language styles for each of the characters as well as the narration. The style of the narrative gives a proper “once upon a time” style, whilst each of the characters has their own voice, which makes them more three-dimensional and real. Grancis and Colette are prominently featured in this story, while Boris and The Captain are featured to a slightly lesser extent. The author introduces two additional characters, which makes me wonder how will they be portrayed in the future stories. I started reading the next book immediately. This story is a flashback of how Colette and Grancis became Nocturna crew members. It goes even deeper into character development, as it visits the time in their lives before they met The Captain. It starts with younger Grancis and Colette, from the time and events relieved by Colette in her dreams in the previous story, and it provides explanation as to how they came to Nocturna. This book starts with a more serious tone than the previous stories, which is understandable, considering the events that occured in the beginning of the book. If I thought before that Colette is rash, now I am multiple times more convinced of that. She is also brave and a fighter who does not give up. That is pretty clear now, if it wasn’t before, just as it is clear that Grancis is a level-headed one in the pair, and equally brave. However, Grancis’ sense of loyalty is unparalleled, as she continues to sacrifice herself in futile attempts to save Colette. The tone of the story changes the moment they discover the portal to Omniverse, when it regains its signature satirical note. The introduction of The Captain and Boris gives it the jovial tone. The introductions of the dynamic duo to the Nocturne crew is nothing short of hilarious, as are their adventures in Wreckwind Port (save from the first one). This story provides a greater understanding of the world Colette and Grancis are tossed in, and it contributes greatly to the world building and character development. As much as I am eager to continue, I think i will make a short break now to savour the awesomeness of the series, as the next book is the last one at the moment, and I am not ready to say goodbye to the Nocturna crew yet. More about Kell Inkston and the Nocturna League Series is available on Goodreads and the author’s website.